Dr Warwick Potter is Director of Performance and Engagement at the School of Music at the University of Queensland. He is one of Australia's leading portfolio conductors equally adept at conducting a professional ensemble as he is a youth orchestra. Warwick is the Director and Conductor of The University of Queensland Symphony Orchestra and Director of the UQ Wind Ensemble. His other UQ roles and responsibilities include being Coordinator of Winds, Director of Large Ensembles, Convenor to the UQ Friends of Music, the concert series UQ Music @ St John’s, the School’s monthly broadcast on 4MBS Classic FM, and the School of Music’s Twitter feed, @musicuq. Warwick lectures in instrumental conducting, bassoon performance, chamber music and woodwind performance classes. Professionally, he has conducted the Adelaide, Canberra, Darwin, Queensland (QSO), Tasmanian, West Australian Symphony Orchestras (WASO) and Camerata of St. John's across a large range of orchestral portfolios. 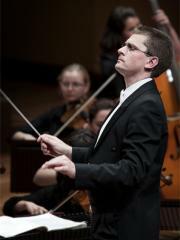 In the youth ensemble sector, he has conducted the Queensland Youth Symphony (at the express invitation of John Curro), Queensland Young Conservatorium Symphony Orchestra, MOST Symphony Orchestra (Musically Outstanding Students - Education Queensland) and the Great Public Schools Symphony Orchestra (Qld) since his move to Brisbane in 2010. He has also been conductor to Queensland Youth Orchestra Wind Symphony since 2010. Warwick was responsible for the technical part of the Australian Music Examinations Board's (AMEB) bassoon syllabus released in 2011. He has extensively examined for the AMEB and adjudicated for multiple eisteddfods in Queensland including Education Queensland's Fanfare program in 2014. As a bassoonist, he has played for the Australian Chamber Orchestra, QSO and WASO within Australia, the latter two orchestras include engagements as Guest Principal. A former holder of an Australian Postgraduate Award, Warwick successfully completed a PhD in Music Performance (conducting) at UQ in 2015. His research into conducting youth orchestras forms part of the creative practice that the School of Music is internationally renowned for.